The European Economic Community (EEC), founded in 1957 for economic cooperation between democracies in Western Europe, was the predecessor of today's European Union. The UK wasn't a founding member of the EEC, but joined in the organization's first wave of expansion in 1973, along with Ireland and Denmark (plus the British territory of Gibraltar and the Danish territory of Greenland). This made the UK automatically a member when the EEC and related organizations were relaunched as the more ambitious European Union in 1993. The UK chose not to join the European Economic Community (EEC) in 1957, but changed its mind and applied for membership a few years later. But its first two attempts to join, in 1963 and 1967, were vetoed by French President Charles de Gaulle. De Gaulle thought the UK was too different from mainland Europe, and that allowing it into the organization could only slow down the other countries' progress. Then, just like now, leaders of Britain's three major political parties favored membership, while British "anti-European campaigners" wanted no part of it. Still, the EEC's other five members - Belgium, the Netherlands, Luxembourg, Italy, and West Germany - favored the UK to join, and after De Gaulle lost power in 1969, France conceded the point. Ever since the EEC was formed in 1957, all the way through the inauguration of the EU and up to today, no member country has ever left the organization. If Britain votes today to leave, it will be the first. But there are three territories that have historically quit the EEC/EU: (1) Algeria, considered part of France until its independence in 1962; (2) Greenland, a Danish territory, which negotiated an exit in 1985; and (3) Saint Barthélemy, a French island in the Caribbean, which opted out in 2012 after splitting with fellow French territory Guadeloupe. 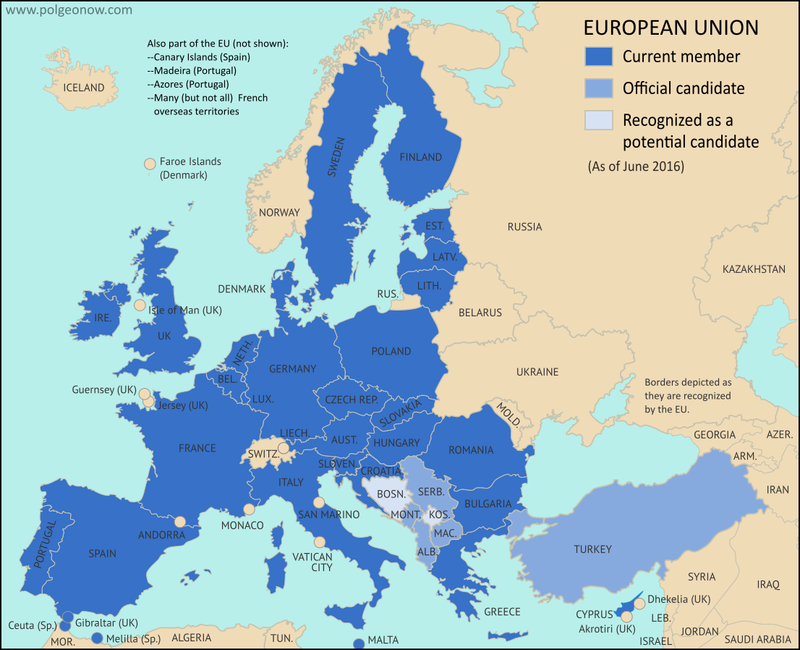 Since these three territories were only part of the EU through connections to their parent countries, the organization never actually lost any members. Overseas territories can more or less leave the EU at will, as long as their parent countries consent. But for member countries themselves - like the UK - the original EEC and EU charters didn't provide a clear path for exiting the organization. For decades, it was up for debate whether countries had an unwritten right to withdrawal, or whether the treaties binding member countries to the EU were legally permanent. This could have made it a long and bitter legal battle if the UK had tried to quit Europe in earlier decades. But since 2009, with a new treaty revising the basic EU rules, member countries have a guaranteed option to negotiate an exit from the organization (though that treaty was nearly vetoed by voters in Ireland). The UK and lots of other countries that used to be part of the British Empire (plus a couple that weren't) are now part of an organization called the Commonwealth of Nations. There about a million voting-age citizens of other Commonwealth countries (such as Australia, India, Canada, or Nigeria) living in Britain now, and British law allows them to vote there as well. But citizens of other Commonwealth countries are only allowed to vote in the referendum if they currently live in the UK. Citizens of all EU countries also have the right to live in Britain, as part of EU law. But they don't get to vote in the EU referendum, even if they live in the UK. That is, not unless they're from Malta, Cyprus, or Ireland. Maltese and Cypriot citizens living in the UK can vote because their countries are also part of the Commonwealth (see above). Ireland left the Commonwealth in 1949, but Northern Ireland is still part of the UK, and a special treaty gives all Irish citizens the right to vote in the referendum if they live in Northern Ireland or Great Britain (British citizens can also vote in Ireland if they move there). The UK still has quite a few overseas territories left over from its colonial days - mostly small islands scattered across the world's seas. Together, they have a population of about a quarter million people, most of whom are now British citizens. But just being a UK citizen isn't enough for you to vote in the Brexit referendum - even citizens from England aren't eligible if they've been outside the UK for more than 15 years (and overseas territories aren't technically part of the UK, even though they legally belong to it). The one exception is Gibraltar, a British territory in southern Europe, whose people have been specially granted the vote as residents of the only British overseas territory that's inside the EU. The Channel Islands and the Isle of Man, whose special status as "crown dependencies" makes them more like younger siblings of the UK than territorial possessions, aren't part of the EU, and residents only get to vote if they've lived in Britain in the last 15 years. When UK citizens go to the polls today, they're joining in a public consultation on whether their country should quit the European Union. But even if they vote "Leave", the UK can't actually exit until its legislature, the Parliament, separately votes to repeal the EU treaty laws. The referendum isn't actually legally binding, so members of parliament could vote against the will of the people if they wanted. But as BBC says, that would be considered "political suicide", and probably wouldn't happen - unless the parliament decides to have early elections, and legislators get replaced by new members campaigning on an anti-Brexit platform. But that's pretty unlikely too, since two-thirds of the current parliament would have to vote to put themselves up early for re-election. Though EU member countries do now have the right to leave the organization, they're expected to negotiate with the rest of the EU over the details. The 2009 Treaty of Lisbon sets a time limit of two years, after which the exiting country doesn't have to put up with any more, and can leave whether it's reached an agreement or not. But many observers think the negotiations would take even more than two years, with the British government agreeing to extend the deadline to avoid a bad arrangement. So even if "Leave" takes the day, the UK will likely be part of the EU for some years to come. Stay tuned to PolGeoNow for more on the geography of the Brexit referendum! Which Countries Are in the EU, Which Aren't, and Which Want to Join? What's the difference between the EU and Europe's Schengen free travel area?